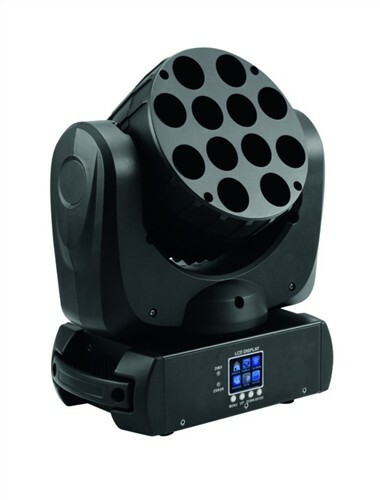 Equipped with twelve 10 W CREE quadcolor LEDs with RGBW colors. Compact lightweight. Narrow beam angle. Positioning within 630Â° PAN and 200Â° TILT. Stepless RGBW color changing. Different dimmer speeds (step response) adjustable. Masterdimmer. 8 internal programs can be called up via Control board. Color-macro-function for an easy selection of possible color-combinations. Strobe effect with 1-18 flashes per second. Random strobe effect. Exact positioning via 16 bit PAN/TILT movement resolution. Automatic position correction. DMX-controlled operation or stand-alone operation with Master/Slave function. Sound-control via built-in microphone. Control board with graphic LCD display for adjusting the DMX-starting address, PAN/TILT reverse, program, reset, operating hours. Switch-mode power supply. Automatic power supply adaption between 100 and 240 Volts without power selector. DMX control via every standard DMX controller.